When it comes to caring for your RV, feeling comfortable in your home away from home while traveling to various destinations is part of the experience. The interior space of RVs, especially used RVs, can feel outdated without remodeling the style and features after a decade or two. To enhance the comfort of your RV, and make it easier to travel, there are a few upgrades to perform before hitting the road. From replacing sofa foam to installing new flooring, there are easy projects you can do yourself that will completely transform the space. One of the most important features of an RV is the furniture that is used, which should be comfortable to relax on during a trip. Cushions are the main culprit here, and usually your first target for replacement. Rip them out and install replacement cushions for a modern style that offers more support. Adding new window treatments will also transform the interior space and allow the RV to look younger with a style that is contemporary and trendy. Consider using fabric that has geometric shapes, bold stripes, or a large print to enhance the decor of the space. You might also consider some thermal curtains, to help block some of the heat of the sun from entering the cab. Similarly, the walls are another source to spruce things up. Remove old wallpaper and paint each wall a neutral shade that still allows the interior to feel spacious. You can also consider wallpapering a specific section to add a touch of decor that creates more dimensions in the RV. 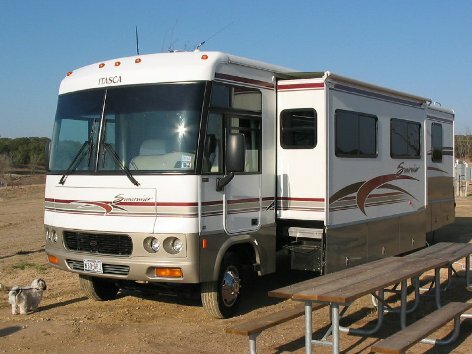 A dinette is one of the main focal points in RVs, and often dates the vehicle. Try ripping out your old dinette and replacing it with a sleeker and more modern table. Dinettes can often take up too much space and be difficult to get in and out of. Instead, more people choose to install a small round table with chairs to free up extra space and allow the RV to look more like a home. You can opt for choosing a table and chairs that have dark wood for a rich space that is more current. You can also add a chair cushion to each seat to ensure that passengers stay comfortable for prolonged trips on the road. Faded blue carpet can equally be a turn-off, and is a popular feature found in RVs. When remodeling the interior, consider practicality and appearance. Replace the flooring with something that can be swept out. Peel and stick vinyl tile is an affordable option and can be used in conjunction with a few rugs to add a cozy touch to the space. Laminated wood flooring is another option for a high-end look that doesn’t require too much effort to install.